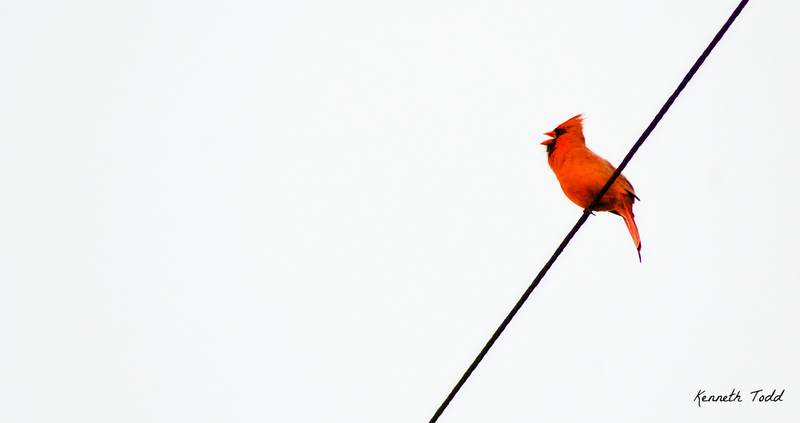 I managed to catch this Cardinal sitting on a telephone wire this a.m. The sky is overexposed and washed out and he is actually in full cry, hence his beak being wide open. Normally these fellas are very elusive and fly away, but he let me come right underneath him to get this shot. I love cardinals! They always remind me of home…Beautiful. Thanks Jodi, appreciate it. Glad I got to remind you of home. Great photo. Cardinal is the state bird of VA & KY, both of my homes. Thanks Mary Lou. I never knew that, but now I do, so thanks. Thanks Joanna. They are very pretty. Thanks Helen. I like that composition technique and you see it popping up from time to time on my photos. Love this image. Simple. Beautiful! I’ve got an elusive bugger that I’ve been trying to catch, too! Love this! That is one awesome bird! If I was bird, that is the bird I would want to be! Gorgeous, love his splash of colour against the sky!